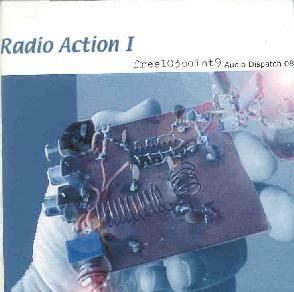 Various Artists - "Radio Action 1"
Free102point9 is a Brooklyn, NY based media arts organization and radio station that promotes experimental sound works and transmissions. Programs include a performance space, recording studio, distribution label and a forthcoming education initiative. This CD includes sound art performances by Monotract, Neptune, Aaron Davidson with Melissa Dubbin, Damian Catera, Japanther, Tantrums, Tom Roe, Laundry Room Squelchers, Seth Price, 31 Down, Jimmy Winchell, The SB, Dymaxion, Transmaniacon MC and Matt Mikas and Barry London and Brad Truax and Jeremy Glover. It is a strange collection of fragments of all sorts of stuff in loops, some musical, some not so musical. It is actually very difficult to describe in general terms without reviewing every track individually and there are 23 tracks. Track 15 is just a brilliant satire about how they assume, rightfully, that Bush would drag us into war. Strange and interesting. For more information visit the frree103point9 web site at: http://www.free103point9.org. Contact via snail mail c/o free103point9; 302 Bedford Ave #261; Brooklyn, NY 11211.